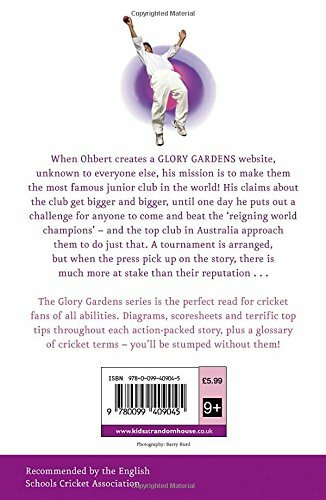 The eighth in a series of cricket novels, The Glory Ashes tells the story of a top notch junior cricket team from England who throw out a world wide challenge on the internet to other junior teams. Naturally an Aussie junior team travels over to take up the challenge and a mini series of one-day-matches follows with a three-day match to end the tour. Predictably, the Australians win the one-day events 2-1 only to be beaten in the three-day match after seemingly having the match in the bag. The book fails to live up to its billing as an action-packed story. It is simply a written commentary on the series of matches with scorecards, batting and bowling averages thrown in for good measure. The characters are too dull to make the book remotely interesting to all but the most die-hard cricket anorak. Even the existence of an Australian in the English team fails to give the storyline a lift. The diagrams and 'handy cricket tips' do not make up for the fact that this is a dull read. Cricket enthusiasts may find this book appealing and the English Schools Cricket Association recommends it but it won't bowl over the uninitiated.